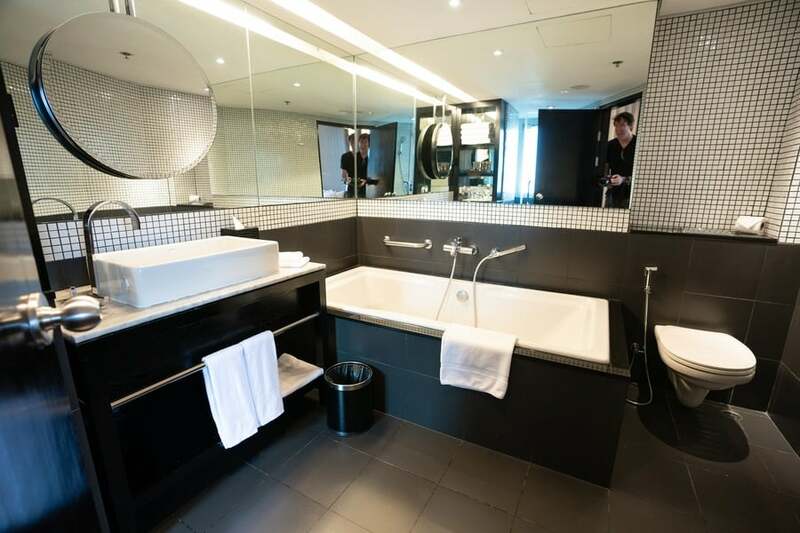 When you think about planning a vacation in Thailand, destinations like Bangkok, Phuket and Chiang Mai jump to mind. But I discovered there’s plenty of reasons to include the coastal city of Pattaya in your itinerary. 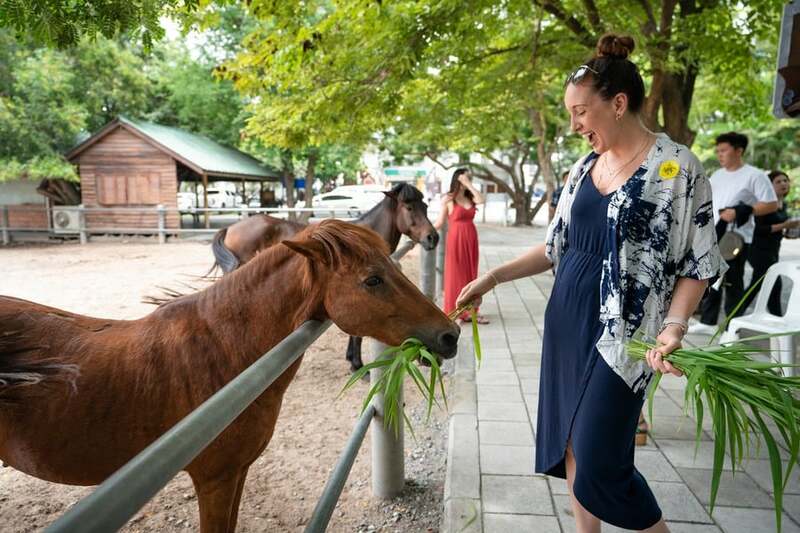 On a recent visit to Thailand, we sandwiched 48 hours in Pattaya between stops in Bangkok and Krabi. 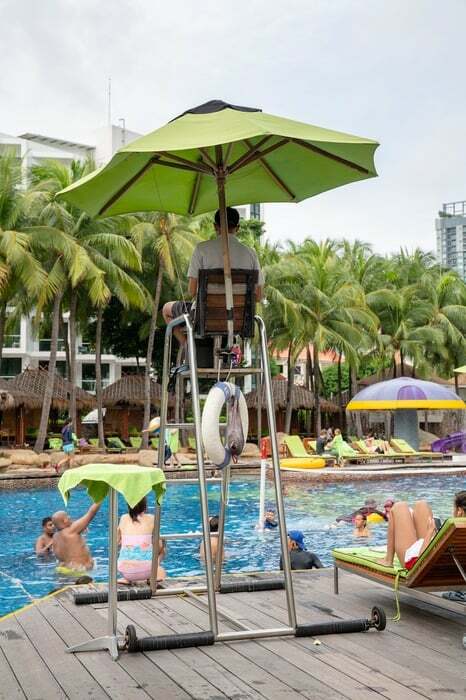 As soon as we arrived and gazed over Pattaya’s dreamy pristine beaches, filled with parasailers gliding above the calm sea, and palm trees swaying gently in the breeze, I knew I’d have to pull out my sharpest travel ninja skills to do this tropical paradise justice. 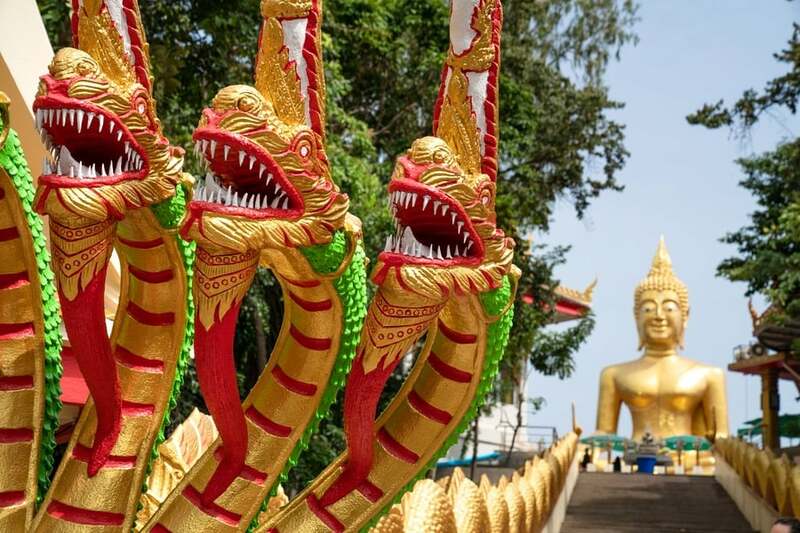 Here’s how we managed to see the best of Pattaya in just 48 hours. The most cost-effective way to get to Pattaya from Bangkok is by a bus operated by Roong Reuang Coach. 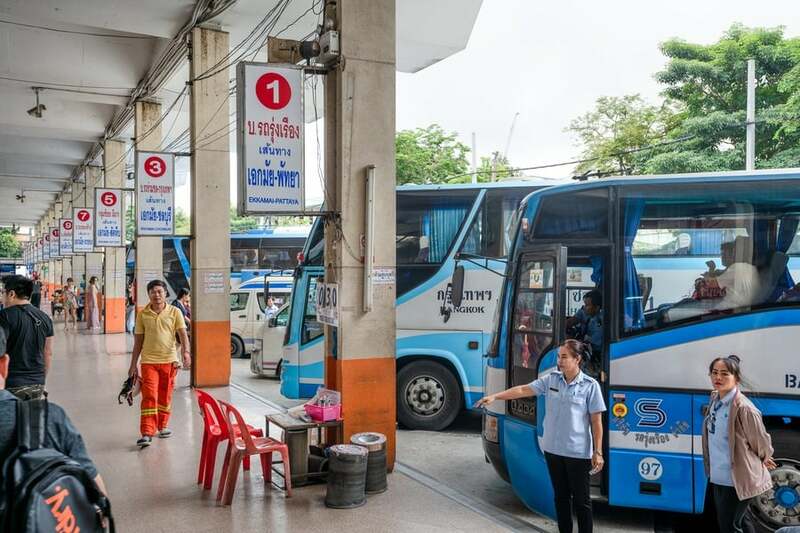 This leaves Ekamai bus terminal every 30-40 minutes between 5am and 11pm, and costs 108 baht per person (including 1 piece of “check in” luggage). The journey from Bangkok to Pattaya takes 2 hours. Bus tickets are available at a booth within the terminal, but I recommend booking a ticket online in advance via 12Go Asia as the busses fill up fast! Keep an eye on your luggage weight (under 20kg is preferable) because the bus drivers charges an excess fee of 20 baht to transport a heavy suitcase. His method for determining an overweight bag was very un-scientific – he held up the bag and pulled an animated face of exertion like an Olympic weightlifter, before signalling “very heavy” and handing me an “excess” ticket to be paid in cash on the spot. Since I had enough fragile items in the suitcase, I didn’t mind the small payment for the peace of mind knowing he’d be a bit more careful with it rather than risking it being thrown around in disgust. If buses aren’t your thing, you can also catch a private mini bus, taxi, or GrabCar to Pattaya which cost up to 1300-1500 baht. Thailand travel tip: If you want to stay longer in the country to explore more destinations, find out how to get a Thailand tourist visa (citizens of some countries can apply for a visa online). We caught a GrabCar (180 baht) from the Pattaya Bus Terminal to the Hard Rock Hotel Pattaya where we stayed in a Composer Suite for 2 nights. After checking in and dropping off our bags, we took a quick look around the hotel and went on the hunt for lunch. 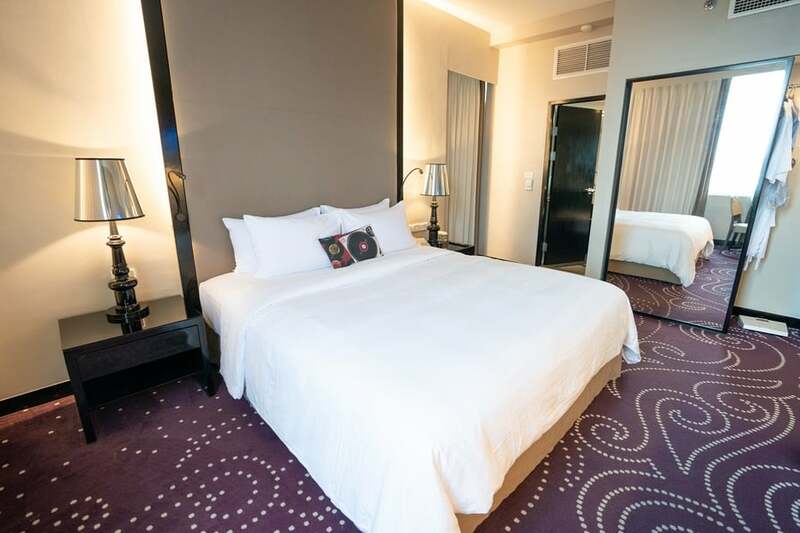 Hard Rock Hotel Pattaya (map) overlooks the stunning Pattaya Beach which, during the day, is lined with watersport offers like jet-skiing, parasailing, kayaking, and stand-up paddle boarding, as well as umbrella-covered sun lounges. 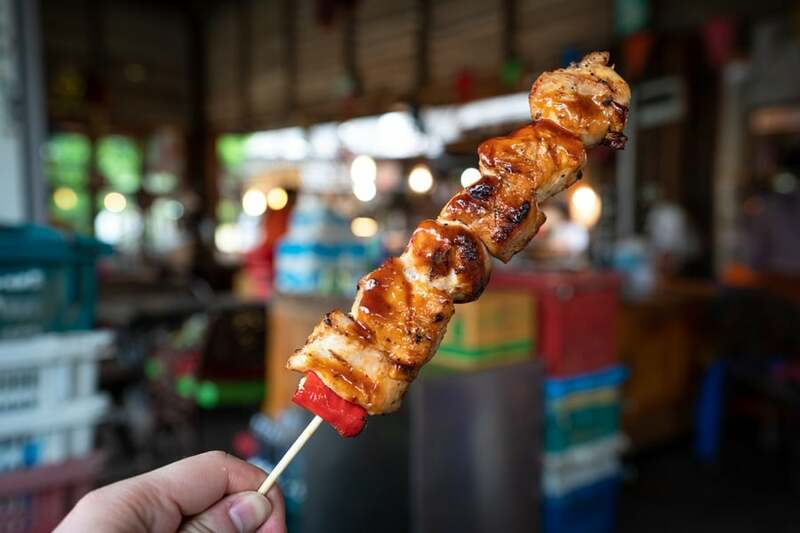 Along the same street, Beach Road, we found no shortage of food options including traditional Thai, Indian, western restaurants, cafes and bars. There’s also a few shopping stalls and massage parlours. We ate at Sher’E’Punjab Indian restaurant. 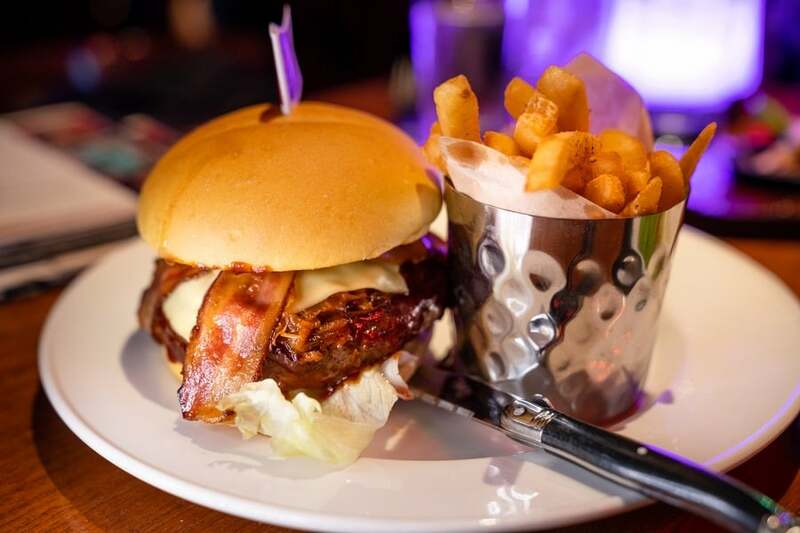 The staff were lovely and the food was flavourful, albeit in relatively small portion sizes. Continuing our walk along Beach Road, we stopped at Mike Shopping Mall to do a little window shopping. This 3-storey mall is lined with smaller market-style stalls selling all sorts of clothes, shoes, bags, jewellery and more. 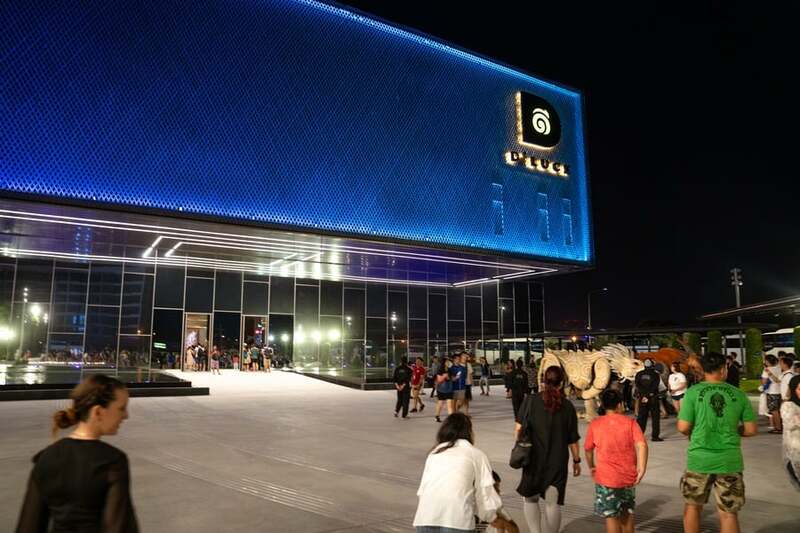 If you’re after a more typical western-style shopping experience, Central Festival Pattaya is a nearby 5-storey mall connected to the Hilton Hotel complex. This mall has a huge variety of mainstream fashion brands as well as a 10-screen cinema and bowling alley. We walked along the super soft white sand as the warm sea lapped at our toes. This is the ideal time to soak up some rays on the beach, or lounge with a fresh young coconut in-hand. If you’re feeling adventurous, try one of the exciting watersports. Back at Hard Rock Hotel we got cleaned up and ready for dinner. 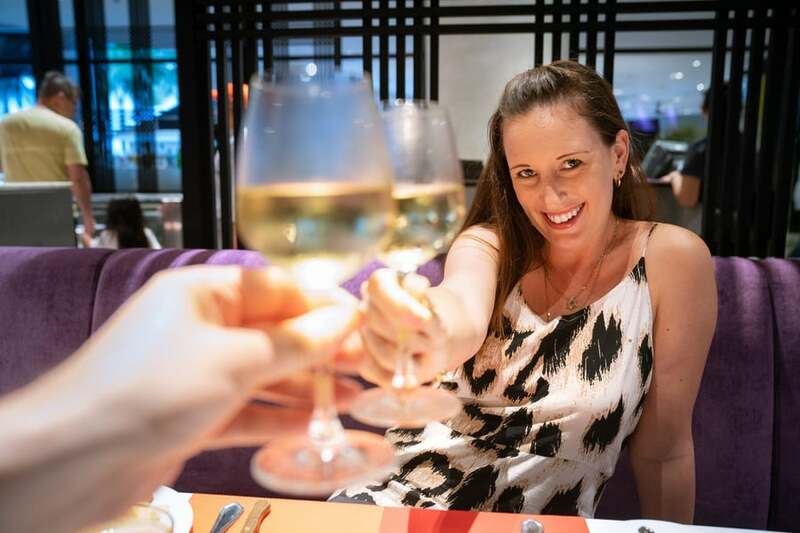 We couldn’t resist a sumptuous BBQ buffet dinner at Starz Diner located within the Hard Rock Hotel Pattaya complex. 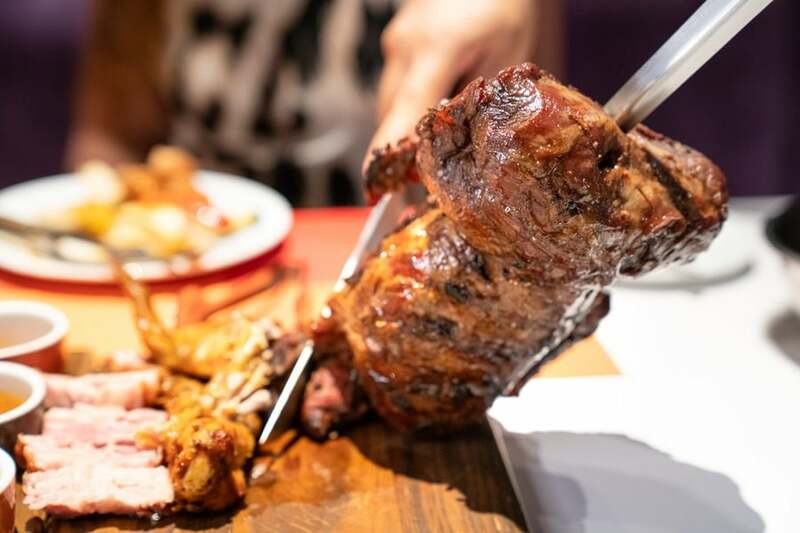 Not only was the food delicious, but the chefs added to the electric atmosphere by bringing various types of grilled kebabs to our table, like chicken, beef, pork and vegetable, cutting off as much meat as we could handle. This was on top of their star-studded salad bar and international cuisines at the buffet. 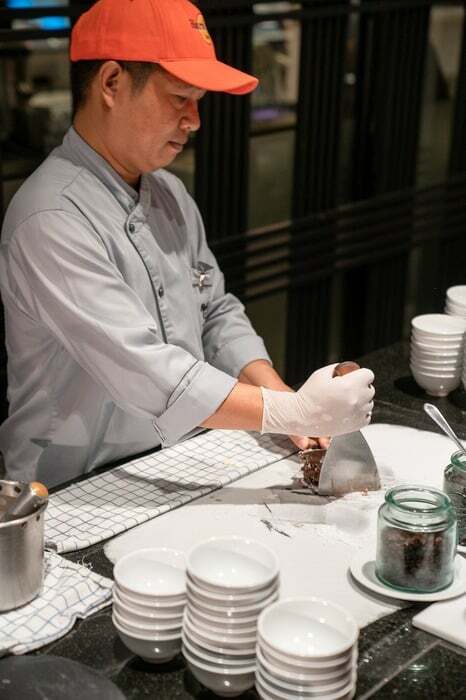 When it was desert time (and let’s face it, it always is), a chef crafted a cold-rock style ice cream creation to our liking. You can choose from a vanilla or chocolate base and add chocolate chips, nuts, or even corn flakes. Yes, corn flakes. Don’t knock it. It’s surprisingly delicious! 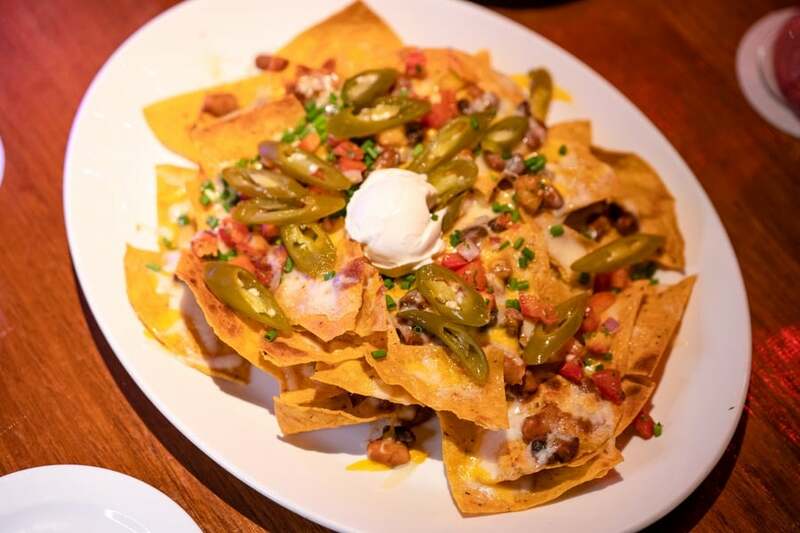 If the barbecue buffet isn’t your cup of tea (I’ll have some serious questions for you), Pizzeria at Hard Rock Hotel serves mouth-watering Italian or you can stop at one of the many dining options along Beach Road. 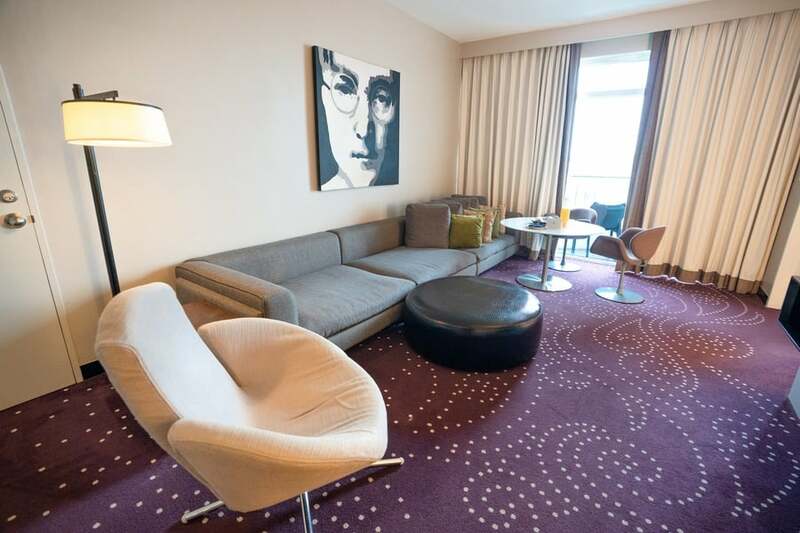 If you’ve got children, hand them off to a babysitter at the hotel and get ready to let down your hair. This kilometre-long road could be mistaken for a ghost town during the day, but when the road closes to vehicular traffic at 6pm, it becomes a pedestrian-only party central. 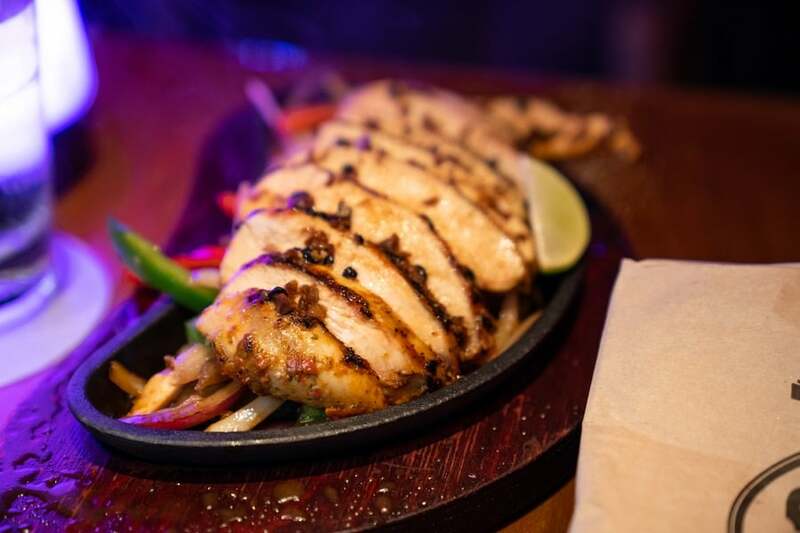 Almost every building and stall is either a bar, restaurant, night club or go-go with exotically dressed door staff eager for you to visit their venue. Walking Street caters to adults (over 18) with a broad variety of music genres, street performers and food vendors. Think of it as the Bourbon Street of Thailand. We stopped for a drink at Hot Tuna Bar and requested a couple songs from the talented local rock band who did not disappoint. 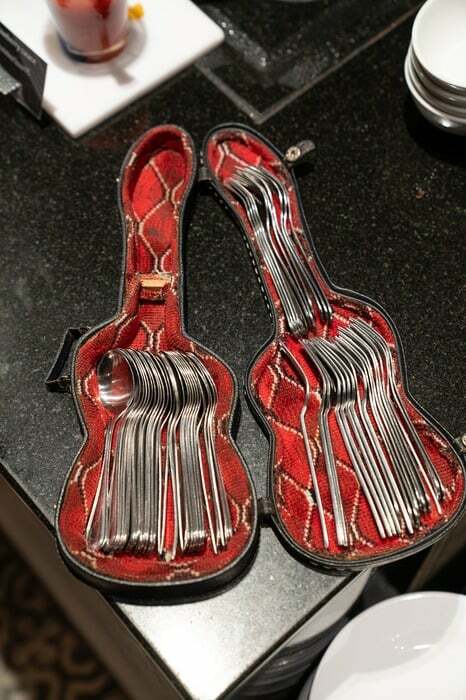 A generous tip is the best way to get your song played. Walking Street is located at the southern end of Beach Road so you can either walk, catch a taxi or GrabCar, or jump in the back of a “bus” (songthaew). Tip: Don’t ask an in-motion songthaew driver for the cost of a ride. Just tell them where you want to go and jump onboard. As soon as you ask for a price, he’ll quote a high figure like 150 baht. As a general rule a ride within the same city costs 30 baht. Keep an eye on Google Maps on your phone so you know where to jump off. Payment is typically made at the end of your ride. After a big buffet breakfast at the hotel, we headed down to the pool for a leisurely swim and to soak up the gorgeous tropical sunshine. 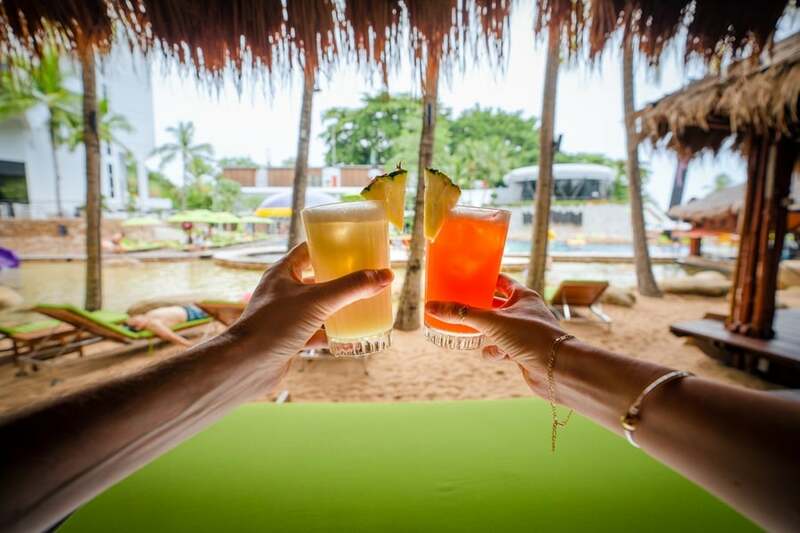 Who says it’s too early for a cocktail from the pool bar? I’m pretty sure Jimmy Buffet had something to say about that. 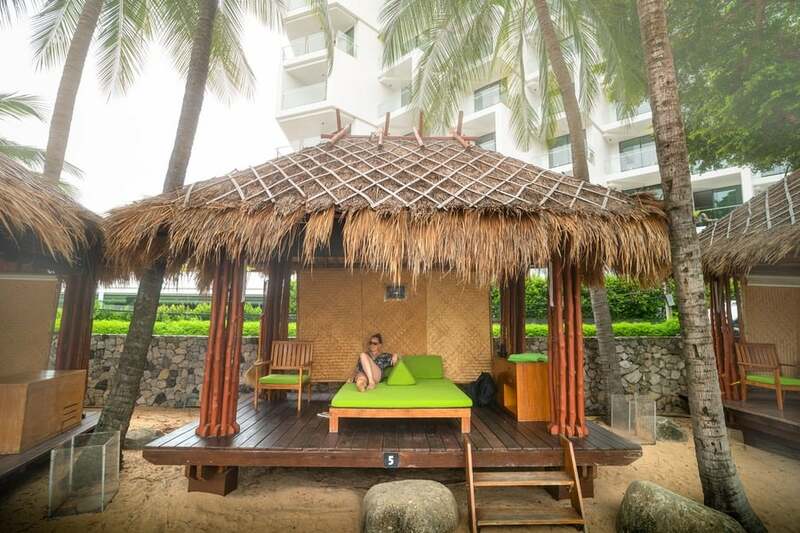 This stunning, hand carved teak structure located on the Ratchavete Cape beachfront would be a good place to spend an entire day if you had the time. There’s no shortage of distracting activities from the moment you walk into the complex until you reach the hand-crafted wooden temple. 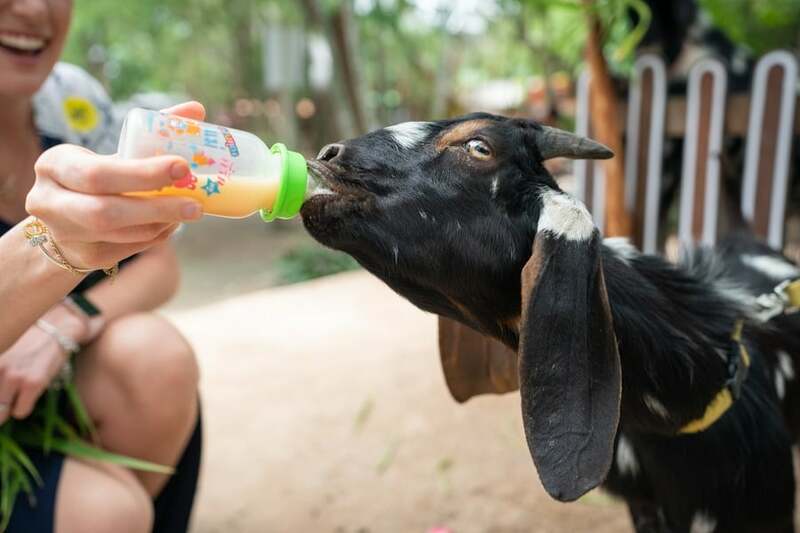 There’s baby animal feeding, horse riding, elephants, canoes, motor cross, live music, a gift shop, playgrounds, and restaurants. Tranquil scenery calms the mind. A short walk through a lush forest and down a staircase brought us to an viewpoint overlooking a small pond. The grandiose wooden structure seemingly floating above the sea. 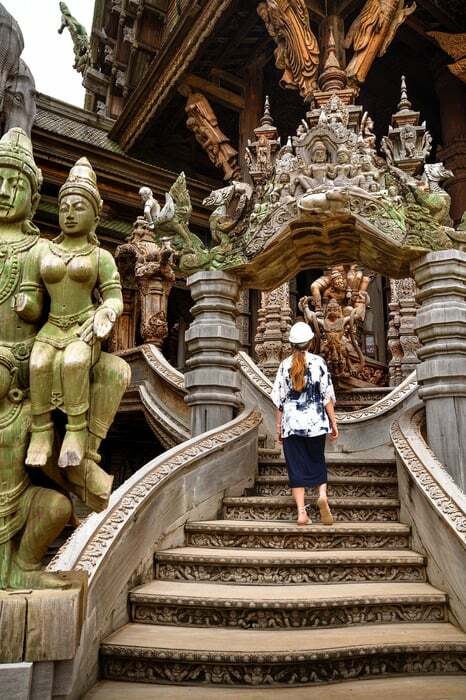 The Sanctuary of Truth is an intricate refection of Thai history, culture and belief systems with stories told in the elaborate wood carvings covering every available inch. 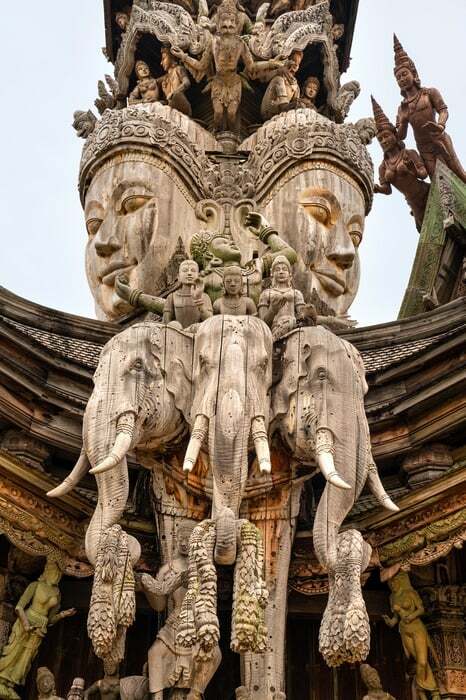 The castle-like building covering 2,115m2 was constructed and carved by Thai craftsmen and artisans without a single nail. 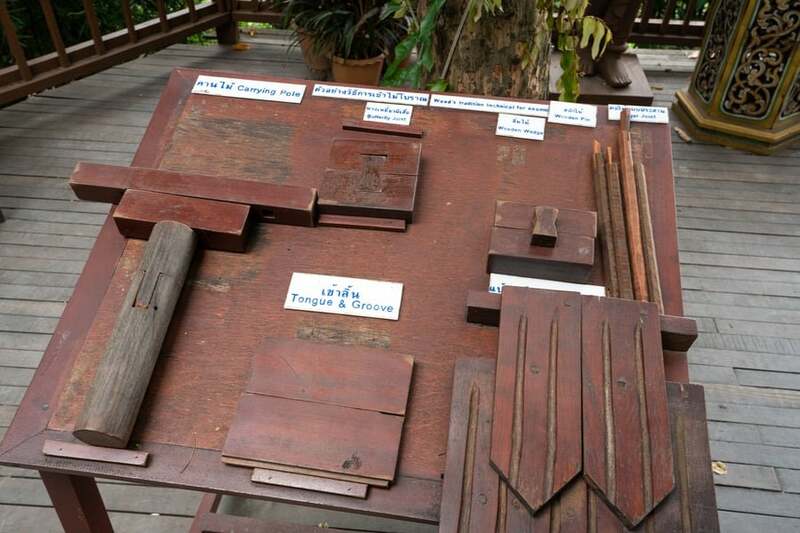 Only natural, non-treated wood has been used and the tropical weather is constantly wearing away at each section. Construction activities are continuously underway to repair and expand the temple so visitors are provided with safety helmets before entering. Entry is 500 baht per person, and standard conservative dress is required before entering. We caught a GrabCar from Hard Rock Hotel to the Sanctuary of Truth, but since Grab isn’t allowed to leave from the area (thanks to the local taxi monopoly), we caught a fixed-price taxi to get to the next stop. 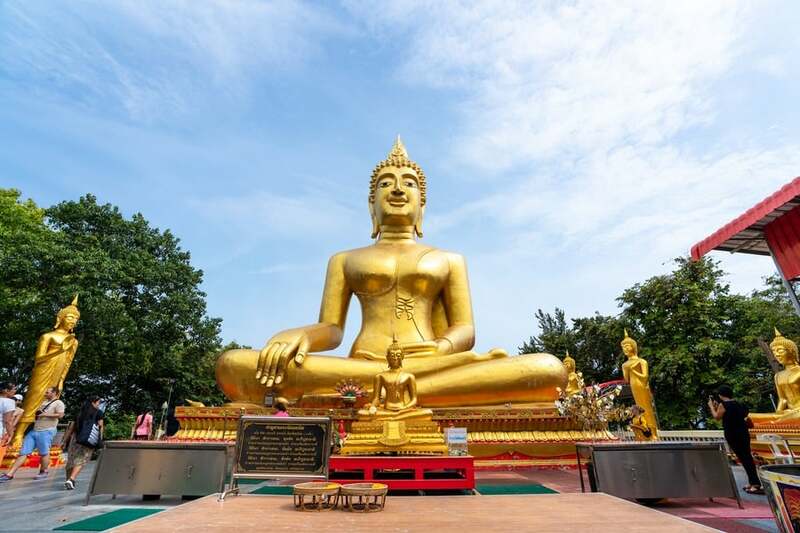 The Wat Phra Yai Temple, known as “Big Buddha Hill”, is home to the largest Buddha statue in the region. 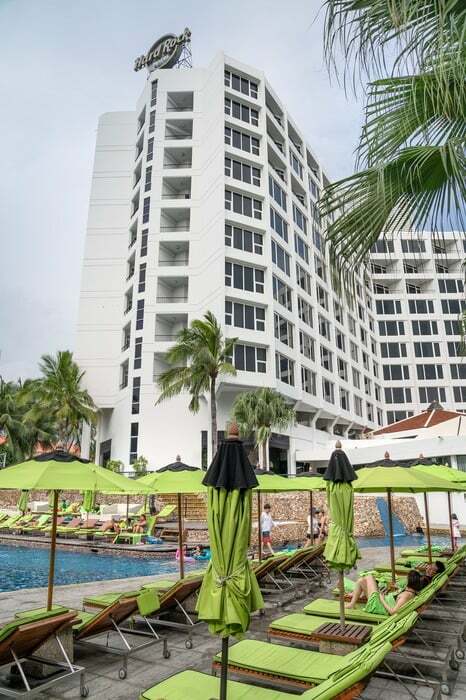 Towering 18 metres high, the elevated location has stunning views of Pattaya and Jomtien Beaches. Entry is completely free and there are a couple tourist shops near the entrance. We captured a few photos from this viewpoint, soaked up the experience, and then caught a GrabCar to the next stop. 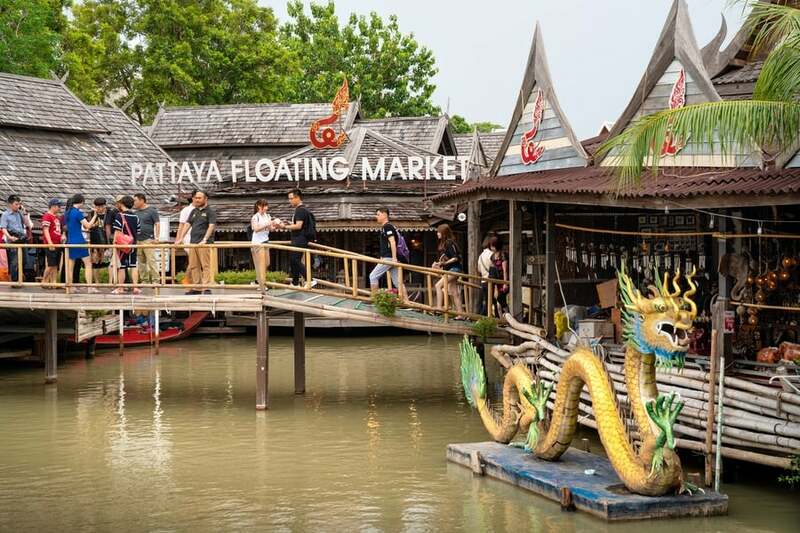 The Pattaya Floating Market offers a different experience to the popular floating markets in Bangkok. 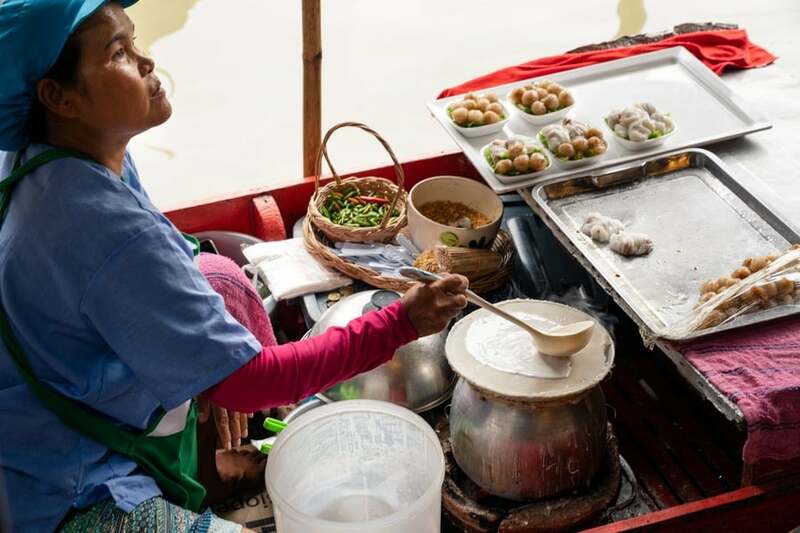 While some food vendors sell their items from floating boats and canoes, most stalls are built into a stilted village connected by bridges and walkways. You can hire a long boat (complete with captain) to float along the network of waterways and get a glimpse of traditionally inspired village architecture and riverside life before taking a walk through the stalls. 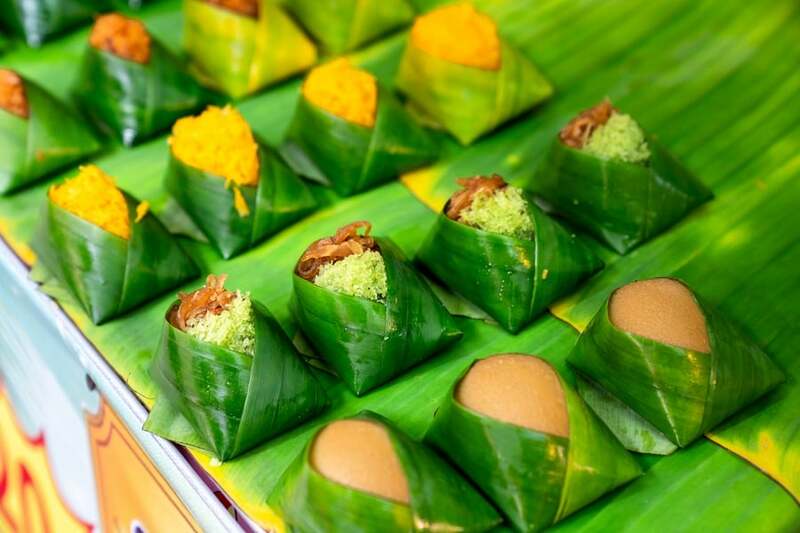 There’s no shortage of authentic Thai street food to taste. We tried sate chicken sticks, mango sticky rice, and a banana roti. 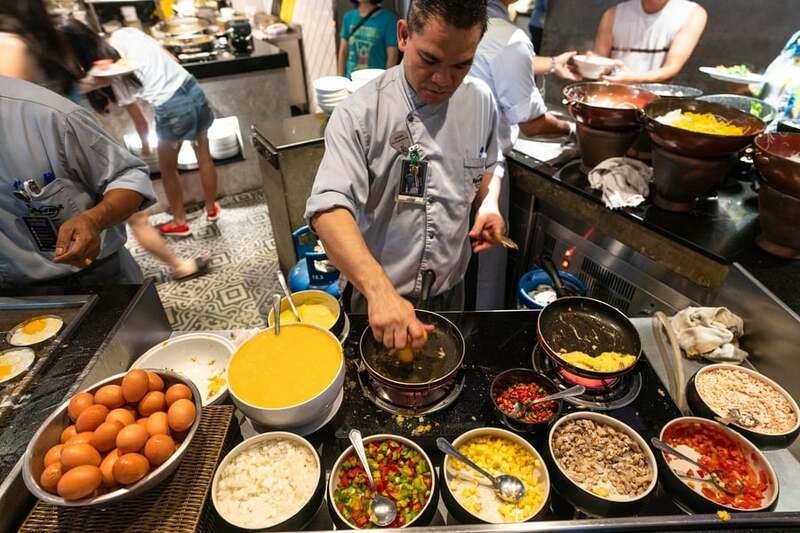 Other options include noodle soup, pad thai, fruits, seafood, grilled crocodile (yes, you read that correctly), more curries than you can poke a stick at, and I even spotted a Turkish ice cream stand (you’re a long way from Istanbul, dude!). 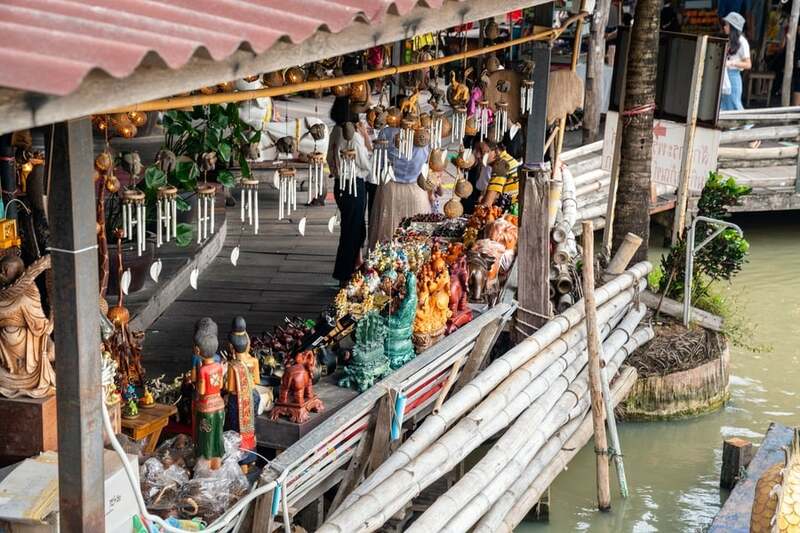 If you’re souvenir hunting, you’ll find a huge selection of handicraft stalls, clothing, and knick-knacks here. 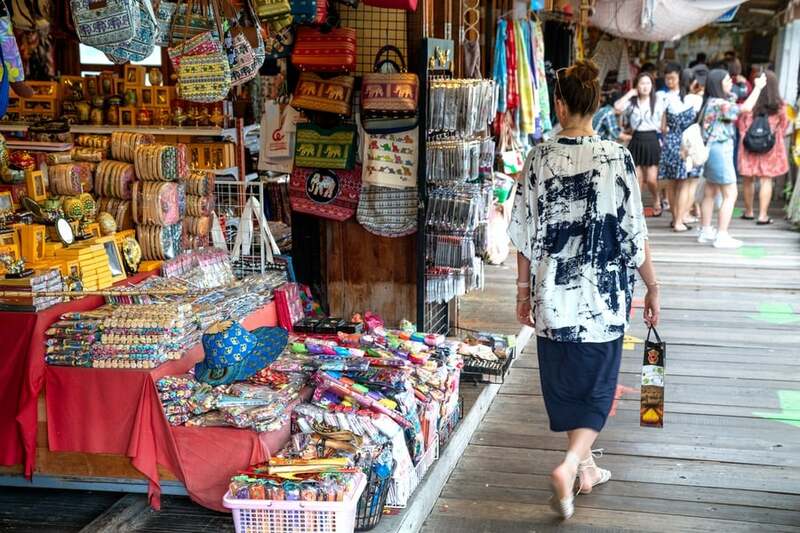 The markets have been split into four sections representing the north, northeast, central and south regions of Thailand. See if you can pick the difference between the food and stalls in each section. Entry is 200 baht per person which isn’t cheap. It can get pretty busy when the tour buses descend in droves so practice your elbowing. We caught a GrabCar back to our hotel just in time for complementary canapés and cocktails at the Rock Royalty Lounge. After being on our feet for most of the day, this was bliss! But there’s no rest for the wicked. There was more fun to be had! If you enjoy performing arts, the family-friendly show KAAN, playing daily within D’LUCK Cinematic Theatre, is not to be missed. 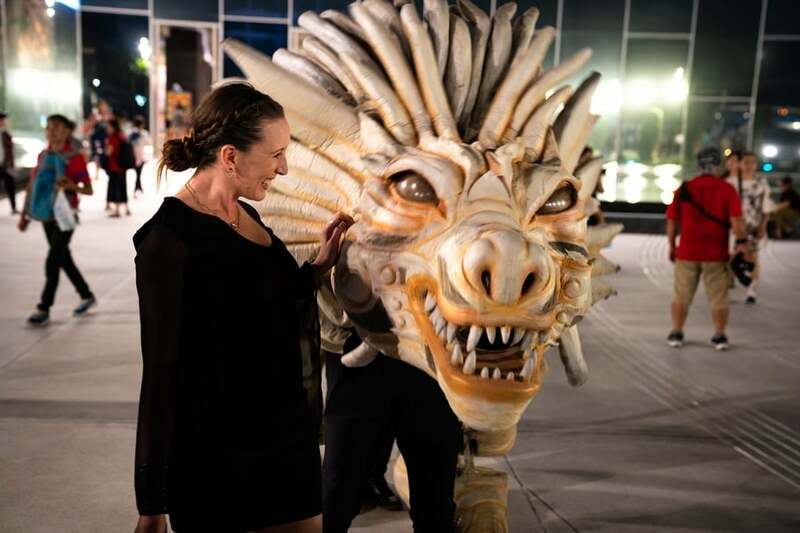 KAAN brings the stage to life with a mixture of dance, acrobatics, cinema and robotics. The narrative blends several popular stories from classic Thai literature around a central character, Kaan, and his flying monkey-esque sidekick “Gabilpuksa”. I was amazed by the perfectly choreographed performers, timing their precise movements with on-screen backgrounds in a style similar to Chinese ballet, Shen Yun. The performers jumped over cliffs, ducked from swooping dragons and dodged giant waves on screen. 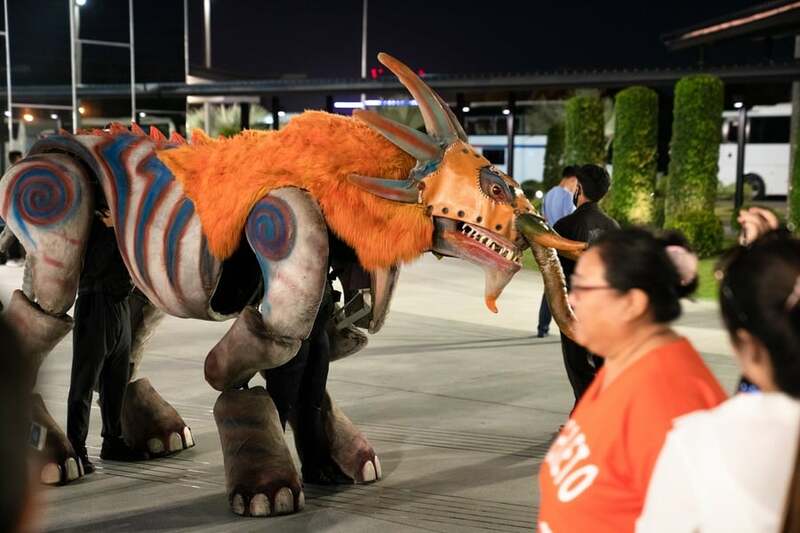 They also interacted with a range of props including bubbles, water, fire, flowing fabrics, mechanical vehicles, monsters, puppets, and more. After the 75-minute show, the audience was invited to the stage to take photographs with the props and actors for a 100 baht fee. Be aware that trained elephants are used in the show, if you are sensitive to this issue. You can purchase tickets to KAAN online for 2500 baht (~US$76) or at the door. We returned to the Hard Rock Café just as the house band, NinetyNine, started to play, and didn’t leave until the end of their last set at 12:30am. They were so good we didn’t want to miss a song! 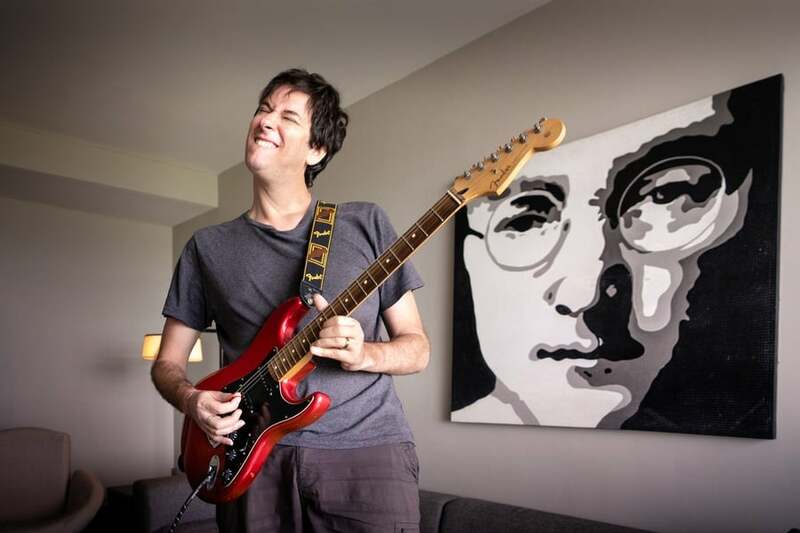 I’ve paid over $200 for tickets to see concerts that were nowhere as entertaining. The band chatted to the audience during their breaks and got to know where everyone was from so they could sing choruses of traditional songs from the home countries when they got back on stage. The lead singer invited everyone up to the front to dance and even joined in. You could tell each band member was passionate about music and it was a privilege to witness the musical chemistry between them. A few audience members requested songs and I was really impressed with the range of music the band could pull out at a few seconds notice. They flawlessly rocked out tunes by Queen, Red Hot Chili Peppers, Aerosmith, Nirvana, and AC/DC just to name a few. If you only do one thing when you visit Pattaya, this has to be it. Check the calendar of performances here. Oh, and the Americana-style food and cocktails were absolutely delicious. Portion sizes are huuuuuuge! 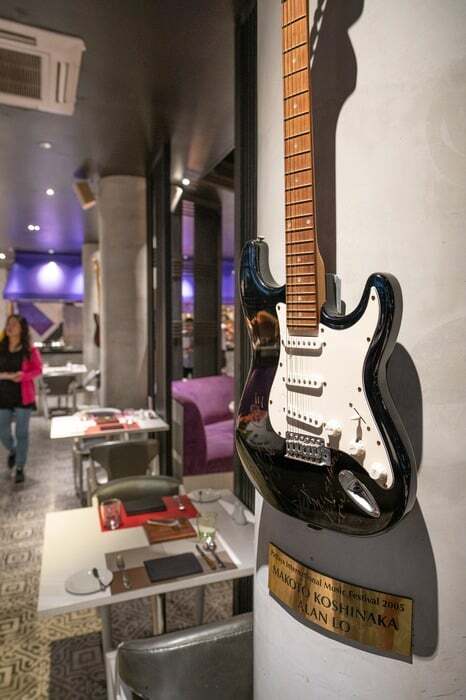 After breakfast, I hired a complimentary electric guitar from the Hard Rock Hotel concierge with their program called “picks®”. 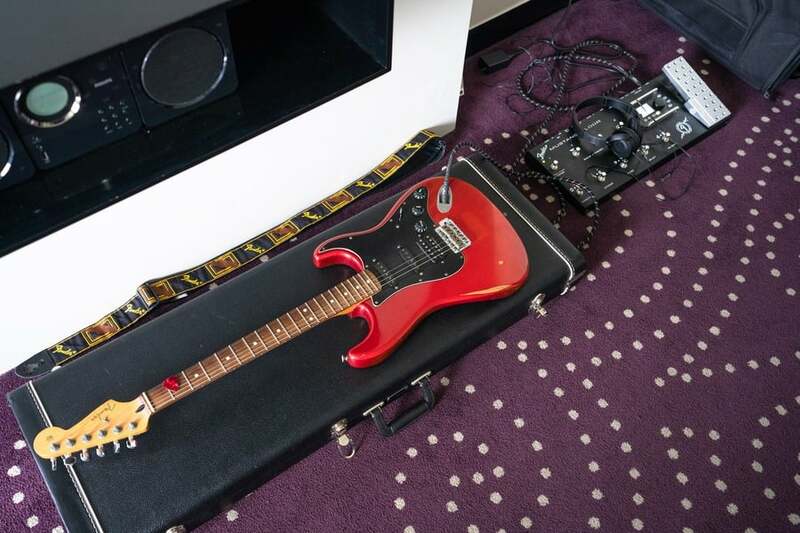 I chose an instrument from the wall-mounted display in the lobby and the hotel staff brought it up to our room and set it up, ready to play. While I’m nowhere as talented as the crew from NinetyNine, at least I almost looked as good! Well… nearly. 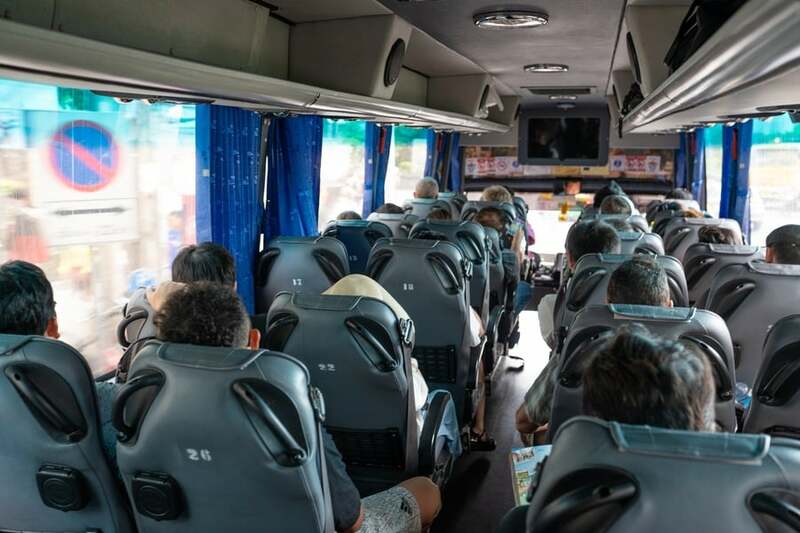 We learned the hard way that buses from Pattaya to Bangkok fill up very quickly as we did not listen to our own advice and pre-book our tickets online. Even though buses run every 30-40 minutes, when we arrived at the bus terminal, there were no available seats on the next 2 buses, meaning we would have to wait for an hour and a half. 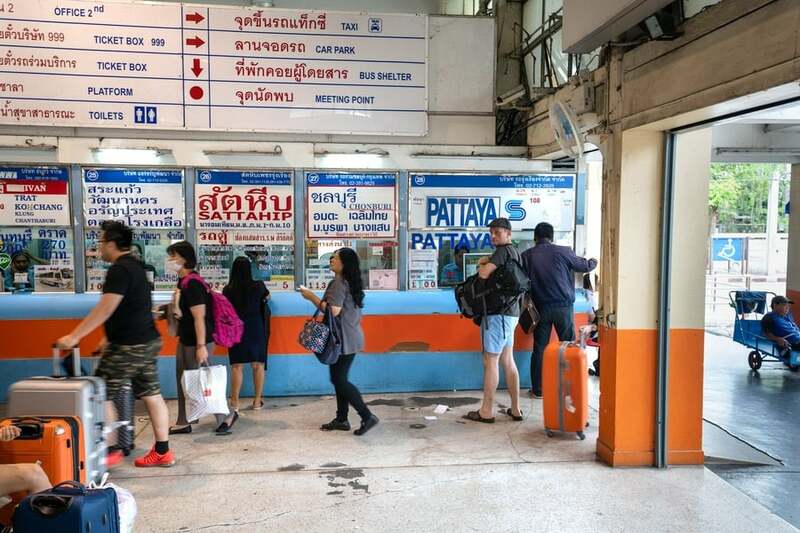 Sellers of private transport were easy to find at the bus terminal and we ended up negotiating a reasonable price (1300 baht) to take a taxi back to Bangkok. Visit Pattaya’s famous water parks: Ramayana, Cartoon Network Amazone or take your kiddos to Asia’s largest indoor playground, HarborLand. Visit elephants with a clean conscience at the Elephant Jungle Sanctuary. While there are several places around Thailand that offer elephant rides, the Elephant Jungle Sanctuary is different and promotes the safe and ethical treatment of Thailand’s elephants and does not allow riding of elephants. See the world’s largest engraving of Buddha at Khao Chi Chan (Buddha Mountain). The gold embossed carving is 30 metres high by 70 meters wide. Watch the famous ladyboy dancers in extravagant costumes at Tiffany’s Cabaret Show. Pattaya dished up a number of pleasant surprises for us. While it usually makes headlines for its adult-centric nightlife, there’s a lot to enjoy during the day. The Sanctuary of Truth was our highlight. It really deserves recognition as one of the world’s most impressive demonstrations of wooden architecture and craftsmanship. The photos just don’t do it justice. It has to be seen to be believed. 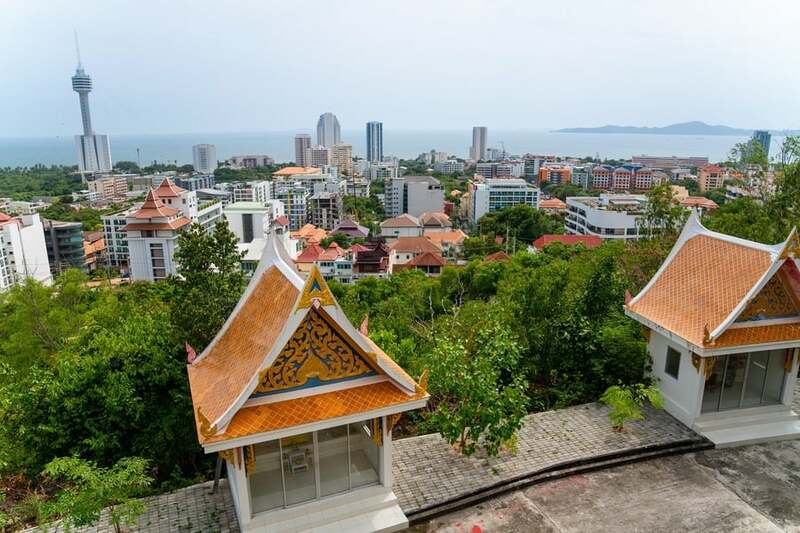 From rocking out to impressive religious sites to long stretches of golden beaches, there’s something for everyone in Pattaya. Great article! It's so fun and amazing to see all the talent from everyone around the world. Sounds like you had a great time! Sounds like and looks like such fun! Thanks for sharing interesting facts about Thailand.